What can I do about a problem water heater? Odor from a hot water heater can be a perplexing problem. Theories of cause and cure abound. Usually blamed on hydrogen sulfide gas, water heater odor is most often associated with well water, but it can happen with city water as well. Here’s advice from the Minnesota Department of Health. –Editor. Unless you are very familiar with the operation and maintenance of the water heater, you should contact a water system professional, such as a plumber, to do the work. Replace or remove the magnesium anode. Many water heaters have a magnesium anode, which is attached to a plug located on top of the water heater. It can be removed by turning off the water, releasing the pressure from the water heater, and unscrewing the plug. Be sure to plug the hole. Removal of the anode, however, may significantly decrease the life of the water heater. You may wish to consult with a reputable water heater dealer to determine if a replacement anode made of a different material, such as aluminum, can be installed. A replacement anode may provide corrosion protection without contributing to the production of hydrogen sulfide gas. Disinfect and flush the water heater with a chlorine bleach solution. Chlorination can kill sulfur bacteria, if done properly. If all bacteria are not destroyed by chlorination, the problem may return within a few weeks. 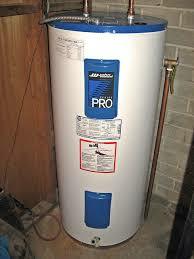 Increase the water heater temperature to 160 degrees Fahrenheit (71 degrees Celsius) for several hours. This will destroy the sulfur bacteria. Flushing to remove the dead bacteria after treatment should control the odor problem. Source: Minnesota Dept. of Health.